Prince V. Thomas joined the faculty at Lamar University in 1998, and is a professor of art, specializing in photography and digital media. Mr. Thomas has also taught at Rice University and the University of Houston. He incorporates a variety of photographic, video and installation techniques into his artwork. With an educational background and degrees in both psychology and art, he investigates and deconstructs complex sociopolitical issues from the interstices in personally expressive ways that humanize his subjects. 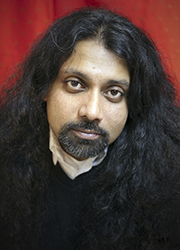 His work has been characterized as poetic moments captured in chaotic worlds, and is soon to be published in two upcoming books, one on contemporary Indian artists and another on American perspectives of the War on Terror. A winner of the Time-Based Media in Art Prize 7 and a Texas Biennial Artist, Mr. Thomas has been invited to be a visiting artist, lecturer, panel discussant, and workshop instructor at numerous institutions including the Contemporary Arts Museum, Houston; Ashkal Alwan Beirut, Lebanon; Indiana University; Memphis College of Art; the Light Factory, the Houston Center for Photography, and the Queens Museum. His work has been exhibited in over 150 solo and group exhibitions at museums, galleries and alternative spaces including Gallerie Huit, Arles, France; The Queens Museum, New York; the Zentral Bibliotheck, Zurich; Fotofest: The International Biennial of Photography; The Museum of Fine Arts, Houston; the Gallery of the National Library of Argentina; Station Museum of Contemporary Art; Bunker 8, Beijing; the Museum of New Art, Detroit; the Alternative Museum, New York City; the Contemporary Museum, Atlanta; and the Station Museum of Contemporary Art. His work is represented in the collection of the Museum of Fine Arts, Houston.